Florida natives, Culture Killer, have signed with Metal Blade Records and are preparing to record their full length debut! Previously, the band had released the “Denial” EP in 2014, and a single “Exterminate Filth” earlier this year. Today, fans can hear a brand new cut that will be appearing on their forthcoming debut. The track, “Justice Through Retaliation“, is streaming exclusively via New Noise Magazine HERE. The ferocity of Culture Killer‘s music and lyrics make it apparent that this band has a goal and message, and that this isn’t directionless rage. The cover art for the “Exterminate Filth” single should make this quite obvious. 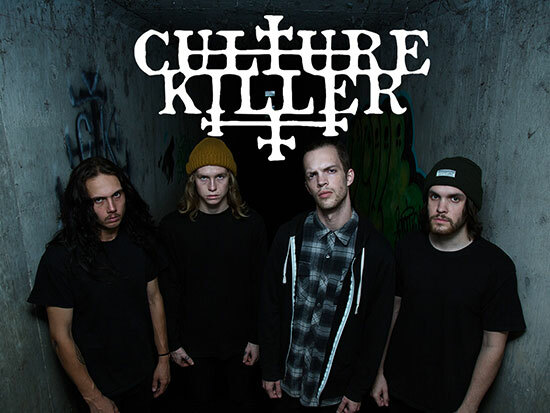 Drummer Dylan Blow elaborates on the topic Culture Killer tackled with “Justice Through Retaliation“: “The song tells the story of a woman fighting a seemingly endless battle with spousal abuse. She reflects on the words and feelings that she once embraced; soon realizing that the man she loved was now her greatest fear. At the turning point of the song, she finds that her only chance of survival is to kill him. More details about the upcoming album will be made available throughout the next few months. The album is expected to be released later this year.